Step back in time to the 1850s in Sovereign Hill, Ballarat, Victoria where people from all around the world travel to try their luck at finding gold and making it rich. This is a fun day out for the whole family as you have hours at leisure to explore Sovereign Hill and all it's fun and interesting activities to help understand and learn how life was back in the "Gold Rush". Your ticket also includes entry to the Red Hill Mine tour and also the impressive collections at the Gold Museum. 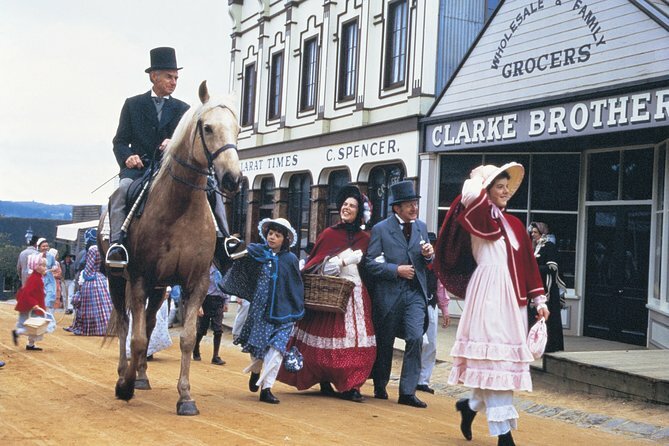 A fun day out to Sovereign Hill for people of all ages! Enjoy a sightseeing coach tour around Ballarat, learn about the history of the area and marvel at it's beautiful old architecture. Travel to the site of the Eureka Stockade where the 1854 Miner's Rebellion was held. • You must try some of their famous homemade boiled lollies! • Watch and pose for a photo with the locals dressed in clothing from the era. Upgrade your tour to include a visit to the Ballarat Wildlife Park. Discover the unique creatures of the Australian bush. Share the Parkers families passion, the family has been involved in caring for Australian wildlife for over four decades. Get as close as you dare to a crocodile at a feeding session, see Tasmanian devils, wallabies, giant turtles, emus and poisonous snakes. Also touch a cuddly koala, encounter kangaroos and meet Patrick, the wombat.